"Fr. André Boland and Fr. Jean-Baptiste Tchang under the bridge of Wan"
Fr. André Boland and Fr. Jean-Baptiste Tchang (Zhang 張) under the large bridge of Wanxian. People in photo: Fr. André Boland and Fr. Jean-Baptiste Zhang of Wanxian. Fr. André Boland and Fr. 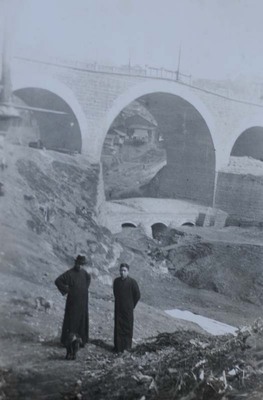 Jean-Baptiste Tchang under the bridge of Wanxian. March 22, 1937. Société des Auxiliaires des Missions (SAM) China Photograph Collection, Whitworth University Library, Spokane.